What is going on? 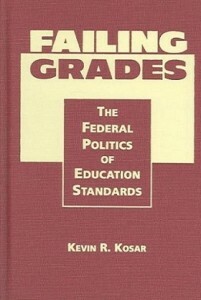 Kevin R. Kosar delves into the political maneuvering behind the crafting of federal education standards policy. Drawing on a wealth of evidence, Kosar argues that high education standards for all students will help raise achievement. Then, turning to the “real world” of Washington, he shows how politics has thwarted tough education standards policy. Kosar concludes with modest proposals for improving the standards and testing provisions of the No Child left Behind Act of 2002 that have a chance of surviving political attacks from both the right and the left. -Student Achievement: A Rising Tide of Mediocrity? 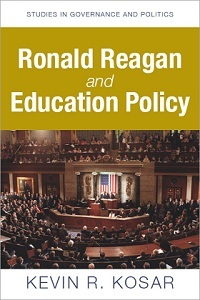 “National Education Standards: Here They Come Again!” History News Network, March 2, 2009. “National Education Standards…They’re Back!” History News Network, March 13, 2006.
Review: Political Science Quarterly, Fall 2006, pp. 533-534.
Review: Choice magazine, June 2006. Mention: NYU Magazine, Spring 2006, p. 74.
Review: The Doyle Report, March 14, 2006. Mention: Eduwonk.com, March 13, 2006.
Review: Education Review, March 6, 2006.
Review: Teachers College Record, January 19, 2006. Mention: Clio: Newsletter of Politics and History, American Political Science Association, Fall/Winter 2005/2006, p. 35. Mention: Politics of Education Bulletin, Winter 2006, p. 6.
Review: Reference & Research Book News, November 2005, p. 240.
Review: The Education Gadfly (Thomas B. Fordham Foundation), October 6, 2005. Interview: Hill Rag newspaper, September 2005, p. 103.